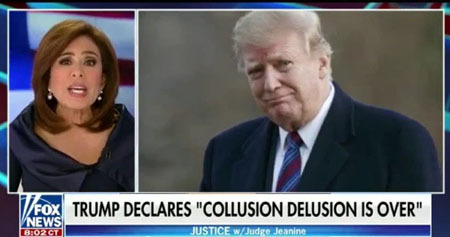 Unless there is “behind the bars justice” for those who engineered the Trump-Russia collusion hoax “then it is a blueprint for a future effort to overthrow the government,” Jeanine Pirro said on March 30 in her return as host of the Fox News show “Justice with Judge Jeanine”. Pirro was off the air for two weeks amid outrage over comments she made on whether Rep. Ilhan Omar was more loyal to Muslim Sharia law than to the U.S. Constitution. Fox News joined several other outlets in condemning the remarks. In her opening statement on March 30, Pirro named former Attorney General Loretta Lynch, former FBI Director James Comey, former FBI Deputy Director Andrew McCabe and former FBI agent Peter Strzok as those that should face scrutiny for setting up a special counsel probe that she likened to a coup. President Donald Trump’s lawyer, Rudy Giuliani, was a guest on Pirro’s return show.